NRG Transplanter, cultivator, weeder and trowel. Features of this garden tool range, focus on unique curved handle shapes, wider and softer grip, lightweight construction and specially designed joints for strength and durability. We gave these tools to various gardeners of differing ages and abilities to get their verdict. The general feedback, surprisingly was mixed with quite polarised views. The wider hand grip on the Radius NRG hand tools and the softer, non slip and easy to clean handle covering, offers people with upper limb problems a little more comfort. Curved, bright green handles, measuring about 20cm in length are designed to follow the contours of the hand. However, the tools still require the user to have at least a moderate degree of grip. A number of our testers, liked the curved grip on the NRG hand tools and all users agreed that the tools were lightweight and seemed sturdy. A great deal of effort seems to have gone into the connection between the blade and the handle, forming an all in one moulded structure, which has been cut away at the neck to make the unit lighter at 240g, but still offering great strength. Whilst the curved handle could provide a more relaxed grip, it does limit rotation when lifting the compost. Users fed back that they felt the end of handle was coming into contact with the earth too soon and got dirty quickly. The addition of A long handled cultivator to the range was suggested, to allow users to work in a more upright position. 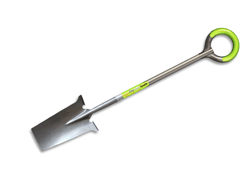 The Pro-Lite digging spade has the design of a standard trenching spade with a narrow leading edge, this tapered design limits the amount of soil which can be lifted at any one time, therefore reducing the strain on the gardener and could also make digging in sticky or stony soil more efficient. The overall length of the spade is 120cm with a weight of only 2kg. The carbon steel blade does cut through the soil cleanly and the spade felt robust and sturdy. Radius produce two ranges of garden forks and spades; The Pro and the Pro-Lite. Handles of the Pro-Lite range are almost 13cm longer than the Radius Pro range, which will be useful to people who find standard garden spades and forks too short. Unique “O” shaped handles offer four times more surface area than conventional handles, allowing the user to adapt hand position to suit their needs. A 90 degree forward bend on the top of the blade also makes it much easier for the user to balance the foot and takes away the nasty ridge found on standard tools which can irritate the underside of the foot when used for long periods. Weight has been kept to a minimum across the range by using a fibreglass shaft which is slightly curved at the neck to allow easier leverage. Flat digging spade, shovel and garden fork. Although, part of a growing collection of “ergonomic” tools to be found in the garden centre, it should be noted that they may not suit every application or individual. 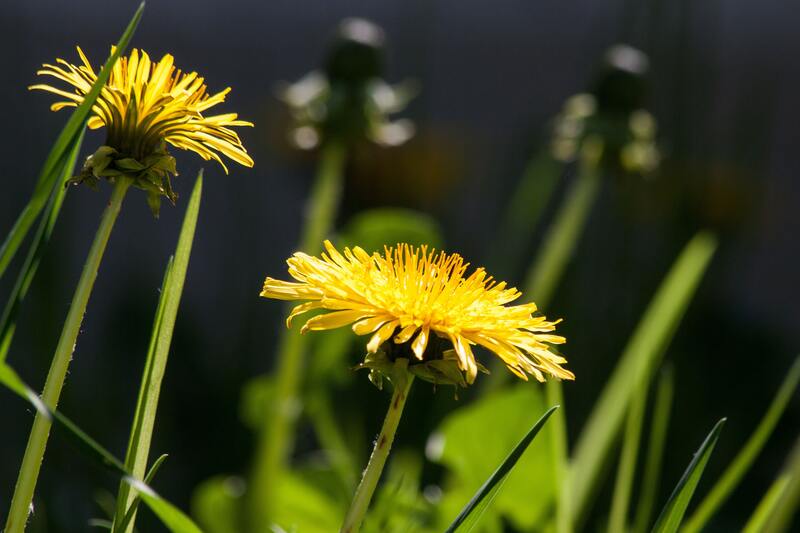 Only choose a garden tool if it feels right for you as an individual. A quick look around a seasoned potting shed will often reveal old, well loved tools, which have become personalised with years of use. If you use the radius garden tool range, share your experience by adding your comments at the end of this article. 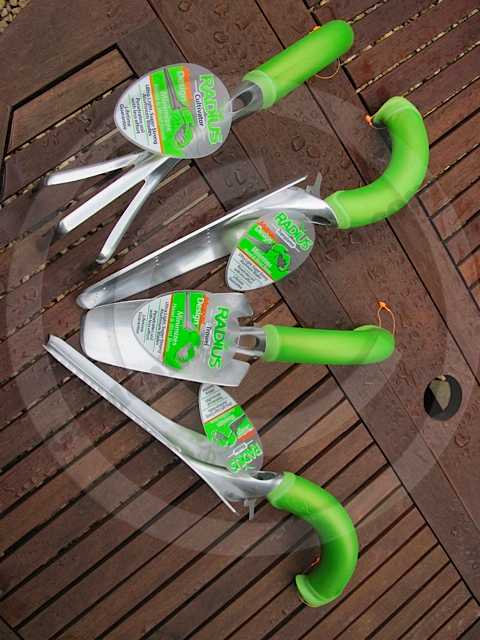 All of the Radius Garden Tool range can be purchased from the Gardening for Health Amazon store.